emperumAnAr dharisanam: thathva thrayam - achith - What is matter? thathva thrayam - achith - What is matter? This article can be viewed as a presentation by clicking https://docs.google.com/presentation/d/188gzTl_qZKtyIxiwKguIjBSkxH-9t9zUw_U98YJGbkk/present#slide=id.p. In the previous article (http://ponnadi.blogspot.in/2013/03/thathva-thrayam-chith-who-am-i5631.html), we observed the nature of chith thathvam (Soul). We are continuing our journey in understanding the three entities (chith, achith, Iswara) through the divine grantham "thathva thrayam" (tattva trayam) of piLLai lOkAchAryar with the help of maNavALa mAmunigaL's beautiful commentary. achith (insentient) is devoid of knowledge and is abode for change/transformation. Since, achith is devoid of knowledge, it purely exists for the enjoyment of others. Unlike chith (sentient - soul), which is unchangeable (does not change its nature), achith undergoes changes. This is pure goodness devoid of any rajas and thamas. This is mainly focussed on all achith (insentients) in paramapadham. manifests as vimAnams/gOpurams (towers), mandapams (halls), etc by the divine desire of bhagavAn instead of being created by the desire of a jIvAthmA induced by his karmA. cannot be quantified/fully comprehended by nithyas (eternally free from samsAram), mukthas (one who became free from samsAram) and bhagavAn himself. mAmunigaL raises a doubt and clarifies it himself - if bhagavAn cannot quantify/fully comprehend this, would it not affect his sarvagyathvam - omniscience (knower of everything)? He beautifully explains that knower of everything means knowing the true nature of everything - so, bhagavAn knows that sudhdha sathvam is unlimited which is its true nature and that is true omniscience. Some say that, this is luminous and others say that is this is non-luminous. There are two opinions about it. But there is more weightage for the view that it is luminous. In such case, it will reveal itself to nithyas, mukthas and bhagavAn. But samsAris will be unable to perceive it. unlike knowledge which grasps thanmAthras (objects of senses - sound, touch, form, taste and smell), this is abode of the subtle elements. When the 3 guNams are equally distributed, that results in unmanifested state of matter. When they are unequally distributed, that results in manifested state of matter. mahAn is the first state of manifested matter. ahankAram comes into existence from mahAn. Subsequently all the other elements (thanmAthras, gyAna indhriyas, karma indhriyas, etc) manifest from mahAn and ahankAram. 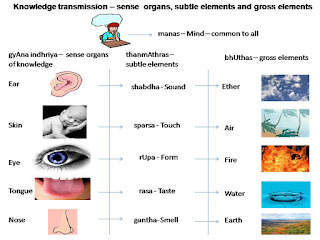 bhagavAn creates the manifested universes by mixing these different elements. bhagavAn creates the universes (effect) and their cause. 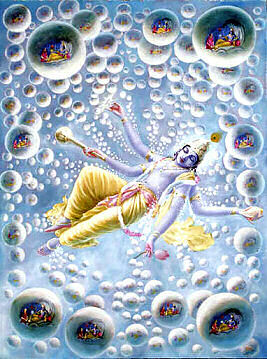 i.e.,transforms the unmanifested mUla prakruthi into the manifested state of elements by his sankalpam (effortlessly). They are created simultaneously and effortlessly by bhagavAn just by his sankalpam. Each universe has 14 layers. mAmunigaL explains in great detail about the structure of the universe based on various pramANams. bhU lOkam - where humans, animals, birds, etc live. Split into 7 large dhvIpams (islands). We are living in jambhUdhvIpam. 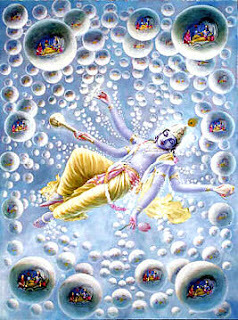 sathya lOkam - where brahmA, vishNu and Siva and their devotees live Each universe (made of 14 layers) is surrounded by 7 layers of protection - water, fire, air, ether, ahankAram, mahAn and finally by mUla prakruthi. panchIkaraNam is the process by which bhagavAn mixes the various elements and leads to the manifestation of the universe as we see it now. acts like a catalyst in the tranformation of matter (from unmanifested state to manifested state and subsequently as well). manifests in different scales of measurement (like day, week, fortnight, etc). mAmunigaL quotes naduvil thiruvEdhip piLLai bhattar who explained classification of time into many parts. Other two achith thathvams (sudhdha sathvam and miSra sathvam) are the enjoyable items, abode of enjoyment and instrument of enjoyment. kAla thathvam is present everywhere (both in paramapadham and samsAram). 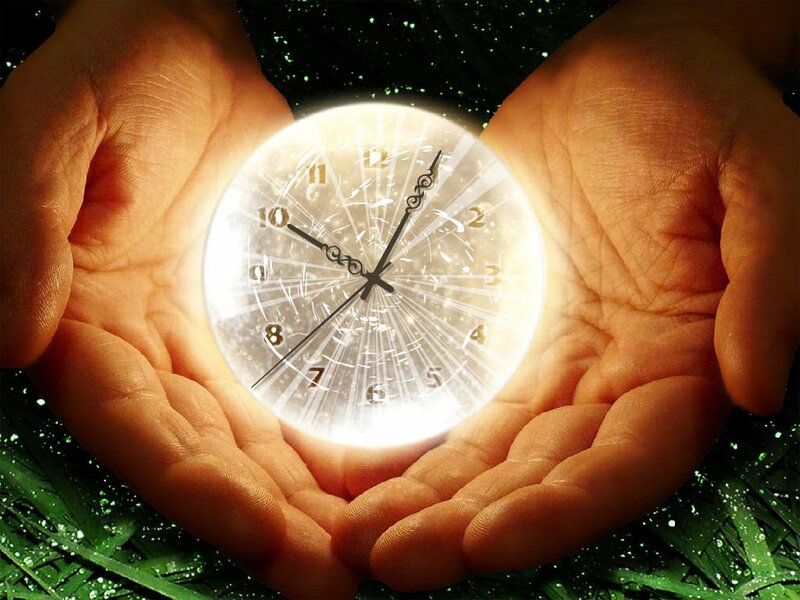 It is said that time is permanent/eternal in paramapadham and temporary/transient in samsAram. mAmunigaL quotes periyavAchAn piLLai's explaination - "time is of uniform (eternal) nature in both paramapadham and samsAram" in his thathva thraya vivaraNam (a grantham which is not to be found these days). So, that is considered as the ultimate authority. But since some AchAryas have explained the difference in nature of time between paramapadham and samsAram - it has to be understood that because of its ever changing nature in samsAram, it is considered as temporary here. Some say time does not exist. But since it defies logic and SAsthramm that cannot be accepted. 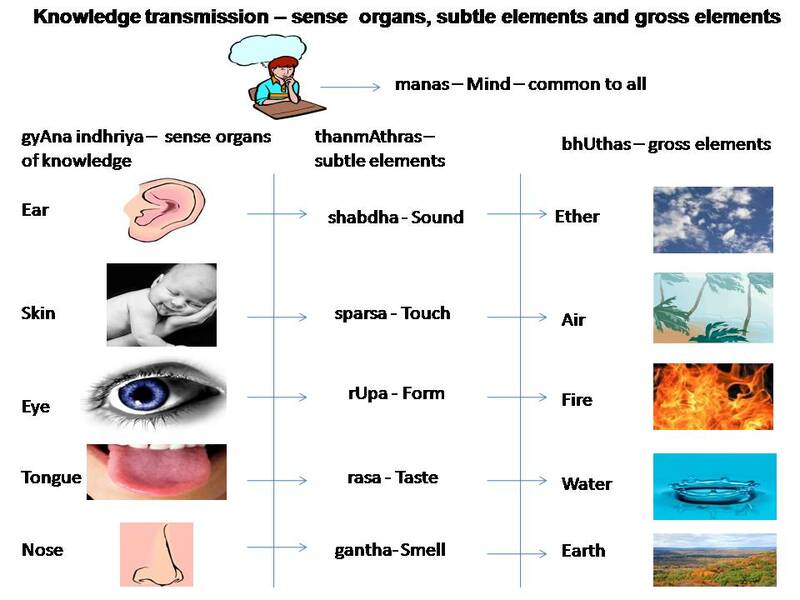 Thus we have seen a bit about the achith (matter) thathvam which falls under 3 categories (sudhdha sathvam - divine matter in paramapadham, misra sathvam - matter in this samsAram and sathva sUnyam – time, common to both places). As said before, this subject matter is very complex and this article is aimed at creating interest to hear this subject matter under an AchAryan in the form of kAlakshEpam for true enlightenment. Up next, We will see in detail about Iswara thathvam (God).